I've been calling myself a noodle addict for years, but it turns out I was just a recreational user. 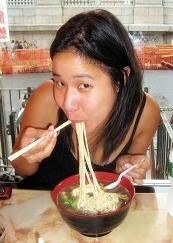 How could a supposed noodle junkie never even attempt to make her own supply? But yesterday, I went for it. In my search for the ultimate niu rou mian recipe, I stumbled onto gaga in the kitchen and her recipe for homemade noodles sounded so irresistibly easy that I had to try it. Guess what? Noodle making is a snap! Do people know about this? All you need is a largish cutting board, a rolling pin, a butter knife, and some flour and water. The trick is to use lots and lots of flour when dusting. 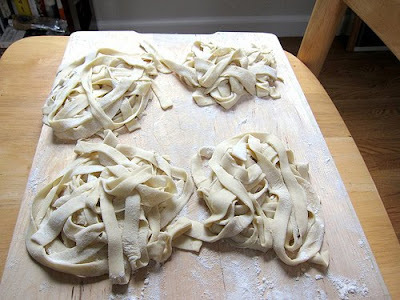 This will make a big mess, but never mind that, flour wipes right up with a damp cloth, and you will be too busy enjoying your tasty, chewy, homemade noodles to be bothered. I used a very different proportion of flour to water than gaga. Not sure if this was a typo in the original recipe, or if she uses a very different kind of flour. Anyway, I did three parts flour to one part ice water and it turned out great. 1. Mix flour and water in a mixing bowl until all flour is incorporated. 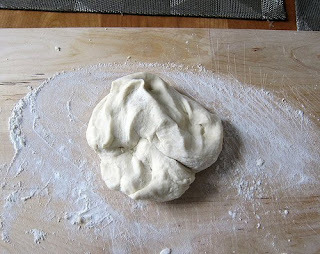 Knead for 3 - 5 minutes on a lightly-dusted cutting board. Set aside, covered, for at least ten minutes to rest. 2. Break dough in half. 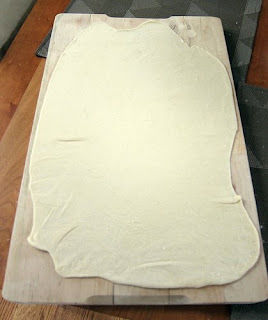 Roll out half of the dough to about ⅛ inch in thickness. Flour the side that's facing you. Roll loosely, shorter side facing you, sprinkling flour as you roll. 3. Using a butter knife, cut noodles to desired width. They cannot be too skinny, or they will be impossible to unroll. 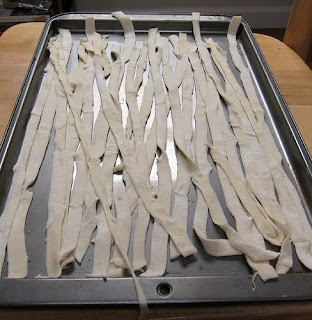 Unroll the noodles and lay them flat on a cookie sheet or other flat surface. Flour liberally. 4. Repeat with the other half of the dough. 5. Get out a very large pot and fill it about ¾ of the way with water. Bring to a boil. 6. While your water is getting hot, arrange the noodles into little bundles. As with all fresh noodles, these cook very, very quickly (in about a minute), so you want to throw them in all at once. 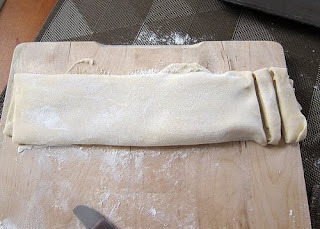 Make sure your noodles are very well-floured, or they will stick together. Once the water is boiling, blanch and remove any vegetables you plan on serving. Then, when the water has returned to a rapid boil, toss your noodles in and give them a little stir with some tongs to make sure they don't stick to the bottom. As soon as your noodles start floating, remove them from the water with tongs. You could also drain them in a colander, if you choose. This made two generous bowls of noodles. We ate every last one. Yummy!! You've inspired me to want to make my own noodles!!! I'm so glad you liked it. It IS super easy, isn't it? (besides the mess you make) but definitely worth the effort. Looks great! It is really, surprisingly simple. My completely kitchen-phobic husband even made some (with a bit of guidance). Did you see the movie A Woman, A Gun and A Noodle Shop? There is a wonderful noodle making scene in the movie. They also seem to set aside the cooked noodles with raw napa cabbage, cilantro, scallions and spices (maybe cooked meat, too). Then it looks like they pour heated oil, almost boiling, over the noodles that are in their large serving bowls. That looked CRAZY YUMMY! I can't seem to find the recipe though. Any ideas? Crossing the Bridge Noodles could be similar, though I swear in the movie I saw a pot of boiling oil, not broth. When the noodle chef poured it over the waiting bowls, it definitely hissed against the moisture of the freshly cooked noodles... Crossing the Bridge looks delicious, either way, and I appreciate you putting some thought into this. I'd recommend the movie for the noodle scene. The rest was really quirky, sometimes super-funny and sometimes pretty violent. I forgot to say that your noodles look JUST LIKE the ones in the movie. Thanks again! Excellent recipe! Thanks for sharing it, I was bored and I made some. They came out DELISH!